My honey addiction soared out of control after I first bought and devoured the most delicious honey ever from the Honey Bee Suppliers' stall at London’s Marylebone Market. 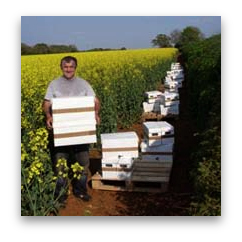 The Honeybee company is run by Viktor Zaichenko, a Ukranian bee farmer and his 'Queen Bee' English wife Lucy, who were married in 2009. They are based in rural Oxon, but fortunately for honey crazed Londoners they also sell their wares at farmers’ markets besides Marylebone: South Kensington’s Bute Street Market, Brixton, Twickenham and Ealing Market. When I first met Lucy and Viktor at Marylebone, and impulsively bought four jars of their honey (Pure Oxfordshire clear honey, Creamed Cotswold honey, Pollen enriched honey and an actual honeycomb), I hadn't studied their informative Honey Bee Website . When I did it was an education. 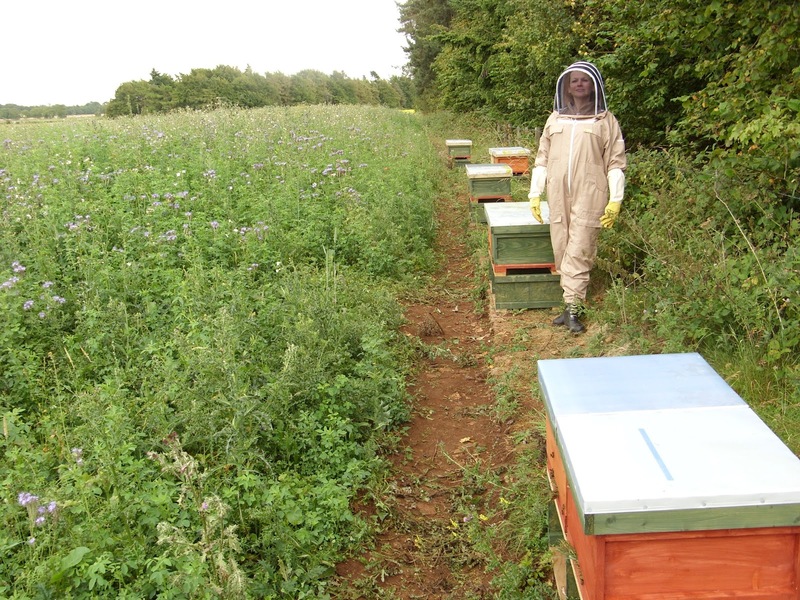 They started with just 29 colonies, full of varroa, and worked from a cramped garden shed and the back bedroom of their house. Viktor has spent his entire life working with bees. 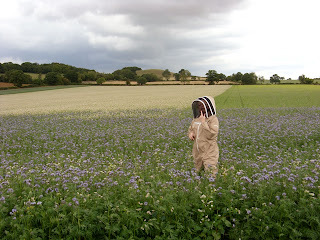 When he was a small boy growing up in Ukraine, he learnt from his father how not to be a bad bee keeper. 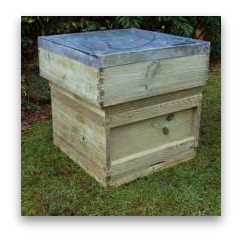 Besides rearing and selling bees and flogging their honey in bulk, Honeybee also sell beehives which is very useful for the recent glut of amateur beekeepers, who keep bees in town as well as in the country. 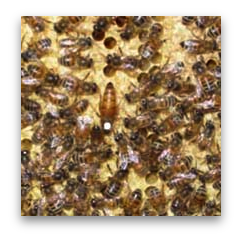 Lucy, who is in charge of the company’s sales and admin also develops her own skin care range, using royal jelly, bee venom, honey and other bee products. She also makes handmade soap. ‘We are just about to start packaging the verbena and lemongrass, and the lavender and the rose geranium. We've been curing for a month, once they have cured they are ready but up till that point we daren't wrap them in case they go soggy. Soap making seems to be quite a science,‘ she says. 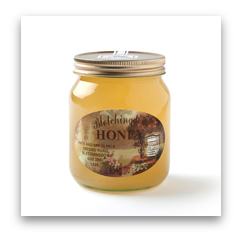 When I ran out of my hoarde of honey, I immediately contacted Lucy on Honey Bee’s order telephone number: 0160 - 873 7190. As Honeybee weren’t going to be at Marylebone Market for another month, Lucy suggested I meet her at St Mary’s Hospital Paddington where she had just been enrolled on an anti bee venom course. Unfortunately for Lucy, she is allergic to bees which is ironic considering she is married to a bee farmer. As she almost died after her last bee sting, she was admitted onto the course, which is full of beekeepers. ‘They inject me with bee venom and I have a larger dose each week, so by the end of my sixteen week course, I will have the equivalent of 3 stings of bee venom in me. That will give me protection.’ Lucy told me before handing over my bounty at St Mary's: six jars of assorted honey in glass jars she had bought down from Oxon to London on the train. Fortunately, I had bought my shopping trolley with me and gingerly pushed my precious honey cargo all the way down Edgware Road, very careful not to bump into anyone.